After getting side tracked by a couple of things (ie. the current bakeoff contest and an audition for a food related reality show), I’m back on the project. I’ve got a little bit of catching up to do but I’m committed to seeing it through until Recipe #52! 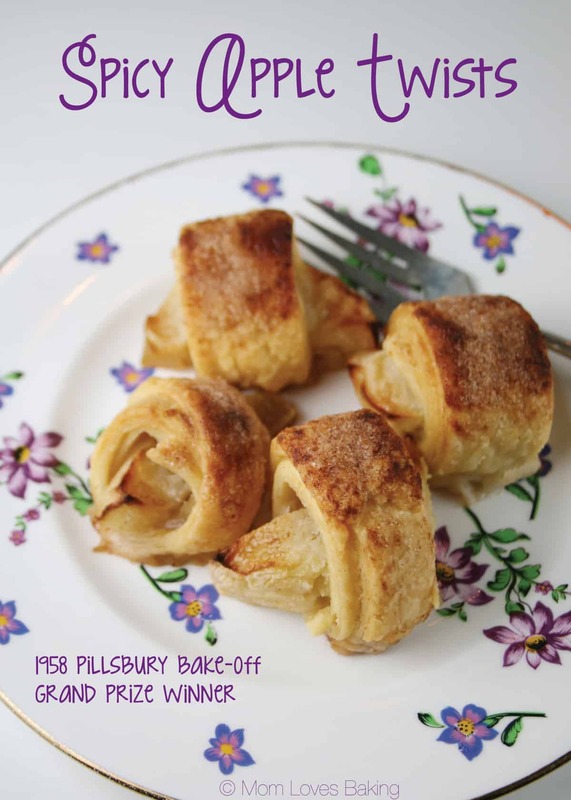 Spicy Apple Twists won the 10th Pillsbury Bake-Off in 1958. Recipe on Pillsbury.com by Dorothy DeVault of Delaware, Ohio. I have to admit I wasn’t very excited about making these. To be honest, the photo on the Pillsbury site isn’t that enticing. But let me tell you, these little gems are very tasty. And they are fairly easy to make with just a few ingredients. 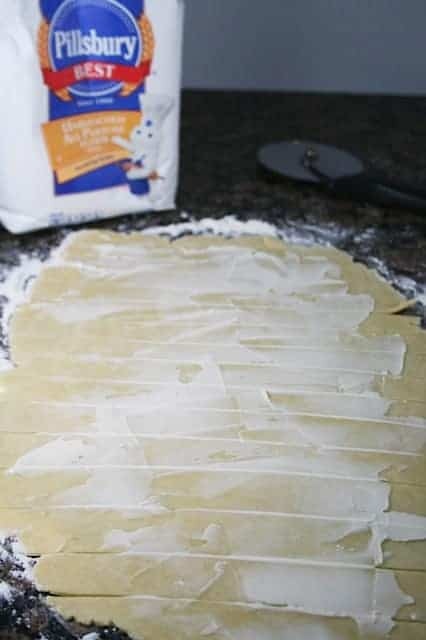 You start by makng a simple pie crust. 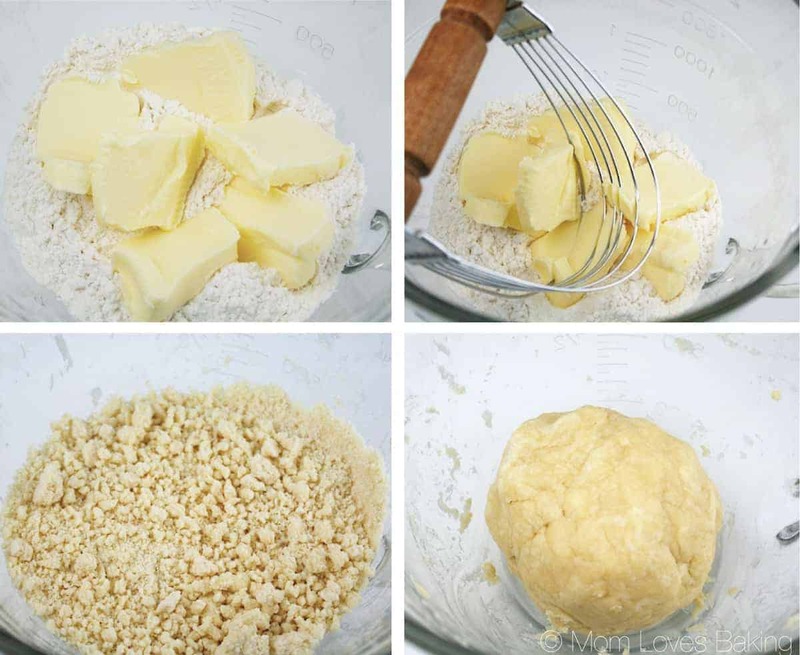 Have you ever used a pastry blender? It’s one of my favorite little tools. It blends the shortening into the flour much better than a fork! (Click here for one like the one I used.) To get the crumbs into a ball, you sprinkle the crumbs with cold water 1 tablespoon at time until it’s moist enough to form into a ball. 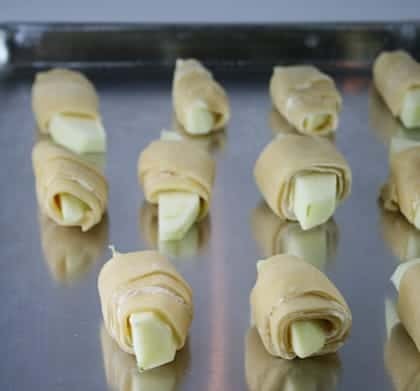 Roll out the dough and spread with margarine. Cut into 16 (10-inch) strips. Peel, core and slice each apple into 8 pieces. 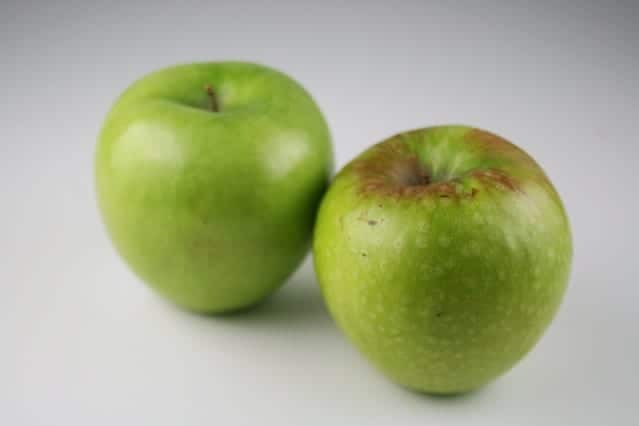 Granny Smith apples are my favorite for baking. They really hold their shape and aren’t too sweet. 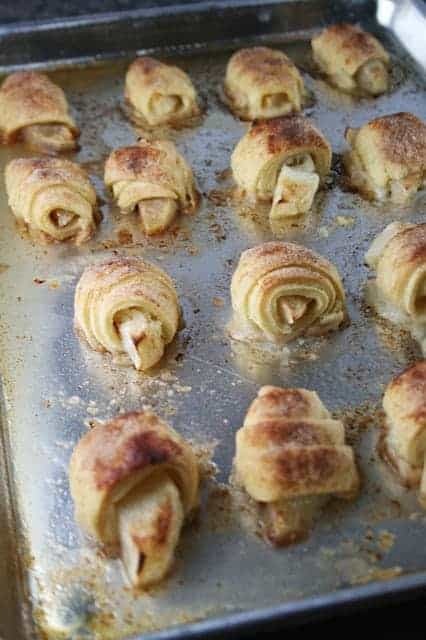 Wrap a dough strip around each apple. Place on ungreased cookie sheet. 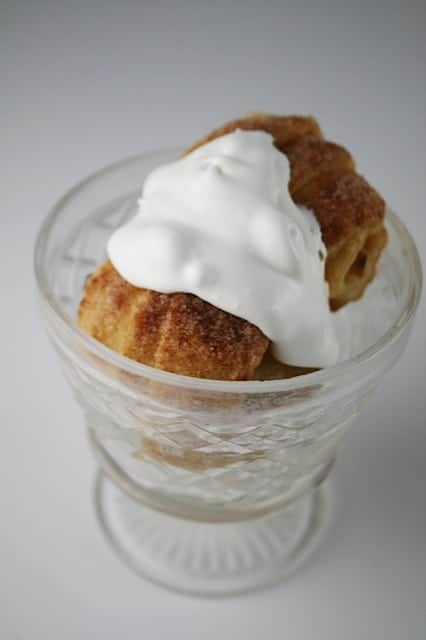 Brush with margarine and sprinkle with cinnamon and sugar. The surprising step about this recipe is: after you bake on 425 for 20 minutes, then you add 1 cup of water to the pan and bake for 12-17more minutes. It makes them moist and prevents them from burning. I served them with cool whip which I added a bit early. I should have let them cool a little more before garnishing. Oops. They were so yummy though! (Key word – “were”). They didn’t last long in this house. How do you like the retro dessert dish that belonged to my grandmother. Do you remember them? Heat oven to 425°F. Cut each apple into 8 wedges. Lightly spoon flour into measuring cup; level off. In medium bowl, blend flour and salt. 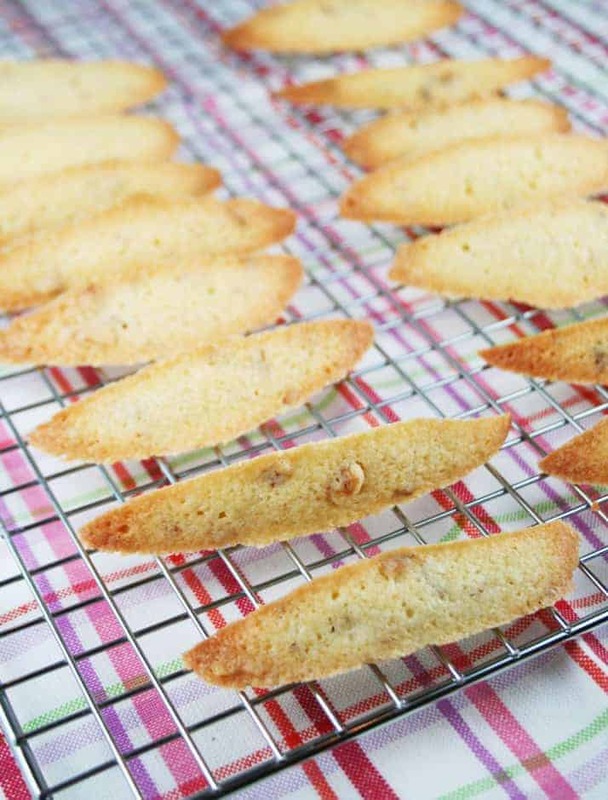 With pastry blender or fork, cut in shortening until mixture resembles coarse crumbs. Sprinkle flour mixture with water 1 tablespoon at a time, mixing lightly with fork until dough is just moist enough to hold together. Shape dough into ball. On floured surface, roll dough lightly from center to edge into 12-inch square. Spread with 1 tablespoon softened margarine. Fold 2 sides to center. Roll to 16x10-inch rectangle. Cut crosswise into 16 (10-inch) strips. Wrap 1 strip around each apple wedge. Place 1/2 inch apart in ungreased 13x9-inch pan. 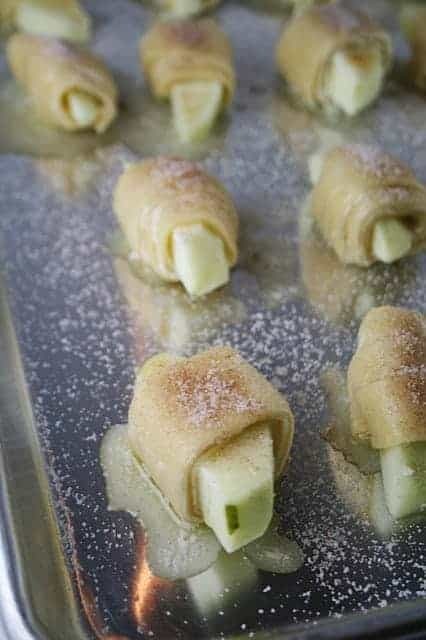 Brush each wrapped apple wedge with melted margarine. In small bowl, blend sugar and cinnamon; sprinkle over wrapped apples. Bake at 425°F. for 20 minutes. Pour water into pan. Bake an additional 12 to 17 minutes or until golden brown. Spoon sauce in pan over twists. Serve warm or cool, plain or with whipped cream.